Home Editorial Why Not Bring Our African Americans Back Home? AFRICANGLOBE – Perhaps it is about time to make a political statement about the oppression of Black people in America and register Africa’s disgust at the situation unfolding in America where Blacks are targets of police brutality and murders. Now, this is a very ambitious proposition, perhaps one that may not be able to see the light of day in our lives. Yet, is it such a bad idea for African leaders to seek to have African Americans back to the continent, their ancestral home? Of course, I hear you asking where they will go, how they will live amidst all the poverty and on a continent which has enough troubles of its own, including failure to feed its children. African leaders are meeting in South Africa this week for the African Union mid-term summit. For years, they have been having the same meetings and talked about all issues in the world from decolonisation to women’s issues. Africa has stood in solidarity with oppressed peoples such as Cubans and Palestinians. Perhaps it is about time to make a political statement about the oppression of Black people in America and register Africa’s disgust at the situation unfolding in America where Blacks are targets of police brutality and murders. It is like America is under some apartheid. It is, let us say. The kind of visuals you see that come to light every other day, thanks to social media, are disgusting and saddening. This week we saw how overzealous white cops broke a party and one officer ended up forcing a 15-year-old girl down on her face, placed his weighty knee on her poor, small back as he handcuffed her. The officer pulled a gun and pointed at other teens who had begun protesting his sadomasochistic show. The scene was a mixed-race pool party somewhere in Dallas and it featured teens. There are reports that someone called the police because there were too many Black kids at the event. And apparently too, there was some violence and some such minor disturbance and the police charging in, in movie style and descended on the kids. They targeted the Black children and carefully avoided white kids. It is there in the footage. The kid who took the video of the disgraceful behaviour of the overzealous white cop was white. His name is given as Brandon Brooks, aged 15. He is quoted as saying: “I was one of the only white people in the area when that was happening,” he told the station. Watch the video and you will be sad. You cry for the African race. These people’s ancestors were stolen from Africa and helped build that country. Many African people have done well for themselves and “their” country, no doubt, including giving white America its first Black President. But the lynching of Black people, especially young people, is back. It is like it’s the 20th century all over again. The pool party is a perfect example of Black lynching not by bloodthirsty gangs of white people, but by police officers who are clearly targeting Black teens who are usually unarmed or when they are, they will be just playing with a toy gun! “Not terribly long ago in a country that many people misremember, if they knew it at all, a Black person was killed in public every four days for often the most mundane of infractions, or rather accusation of infractions — for taking a hog, making boastful remarks, for stealing 75 cents. For the most banal of missteps, the penalty could be an hours-long spectacle of torture and lynching. No trial, no jury, no judge, no appeal. Now, well into a new century, the rate of police killings of Black Americans is nearly the same as the rate of lynchings in the early decades of the 20th century. We are told that even though white Americans outnumber Black Americans fivefold, Black people are three times more likely than white people to be killed when they encounter the police in the US, and Black teenagers are far likelier to be killed by police than white teenagers. Shanon Barber, a blogger, notes that: “Police brutality is accepted — and sometimes even celebrated — against Black America. This is the result of the racism that started with slavery, continued during Jim Crow, and spills over into the racist ideals of a white system that has yet to be dismantled. And America has become a police state. 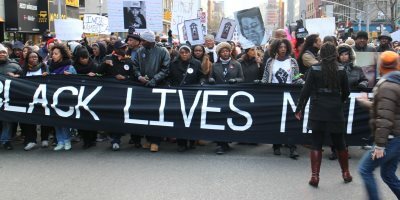 Harvard scholar Garikai Chengu says Black people in America “live in a police-state-within-a-state” which exercises its authority over the Black minority “through an oppressive array of modern day lynchings by the police, increasing for-profit mass incarceration and the government sanctioned surveillance and assassination of Black leaders”. On the other hand, the police is now heavily militarised both by way of weapons and by way of tactics. Blacks and other minorities are constant targets. The Guardian cites a research by Peter Kraska, a professor at Kentucky University, which has tracked the exponential growth in the use of paramilitary tactics in the US whereby in the 1980s there were as few as 3 000 SWAT (Special Weapons And Tactics) raids a year, but by around 2005 that number had leapt to 45 000. It is said that the Pentagon channels military equipment used in Iraq and Afghanistan to domestic police forces under its 1033 programme, which had transmitted 15 000 items of battle uniforms and personal protective gear during the survey period. Now police strut about with dangerous weapons such as automatic and semi-automatic rifles, robots from Afghanistan that can be weaponised, armoured vehicles and armoured personnel carriers. The police will be more than happy to use the equipment — and on Black people first. African sons and daughters are being brutalised and killed. It will take some courage from African leaders to denounce such apartheid. At any rate, this is the America that preaches human rights and liberty and will be quick to point fingers where legitimate policing takes place to subdue illegalities elsewhere. Talk about the speck and log in the eyes. My mind goes back to the girl in swimming costumes being held to the ground by the burly, brutal police officer. She is an African child. Her name is Dajerria Becton.